Freez DVD Ripper is a simple tool that will allow you to rip the contents on any DVD to be able to make backup copies of your original video DVDs, at the same time that it converts the videos to a format that is a lot lighter and occupies less space. The software application will allow you to pass any film on DVD to H.2.64, MP4, Xvid, DivX and the iPod format. - Customization of the conversion options (bitrate, size, audio channels,...). - Capacity to select the language tracks that you want. - Option to integrate the original subtitles. - Compatibility with encrypted DVDs. The program's interface is very practical, because you'll be able to view all the application's options from the same window, something that will make the ripping process much easier. 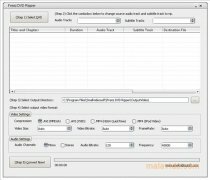 Download Freez DVD Ripper and discover a brilliant application to transfer your films on DVD to the computer's hard drive.